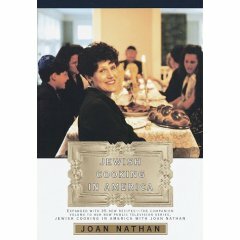 Joan Nathan's Jewish Cooking in America. I have to admit I have always wanted to write a breakfast column. One look at my many cookbooks reveals that the most frayed pages contain recipes for the first meal of the day. It is a family thing. Growing up, Sunday dinner at my husband's house was usually pancakes, waffles, or French toast with all the accoutrements. Growing up, I often enjoyed scrambled eggs or a frittata with home fried potatoes and toast with jam as a simple, nutritious supper. Just as for Jerry Seinfeld, snack or dessert at our house now is more likely than not, a “B.O.C” (bowl of cereal). It’s not really the time of day, but the foods themselves that make breakfast foods, comfort foods. Around the world, Jewish cooks have always had special foods to greet the day. Joan Nathan describes in Jewish Cooking in America the pfankuchen, the traditional oven-baked apple pancakes beloved of German and Alsatian Jews, and the mamaliga (corn meal mush) enjoyed by the Jews of Romania. Bialys—those wonderful cousins of the bagel, topped with onion and garlic and made with an English muffin-like dough—came to this country via the Jews of Bialystok, Poland. My personal favorite breakfast is the delectable Lox, Eggs, and Onions with my toasted bialy and coffee on the side. I remember comedian Steven White’s response to a sign outside a diner announcing ‘Breakfast Anytime,’ telling the server, “I’ll have French Toast during the Renaissance.” Whether you like your aruchat boker at the crack of dawn or as a bedtime snack, I think you’ll enjoy these breakfast goodies. This European breakfast specialty was traditionally made with diced lox wings and heads, generally available from a kosher deli that sells fish, but I use sliced smoked salmon, preferably the less-salty Nova. The best lox, eggs, and onions I ever had were at Barney Greengrass “The Sturgoeon King” on New York’s upper west side. Sauté the onions slowly in the butter/oil in a frying pan with a cover. When the onions start to soften, cover, reduce the heat to low, and cook about a half hour, until the onions are very soft. Remove the cover and cook until golden. Bet the eggs well in a bowl and pour over the onions. Cook slowly, stirring gently. Just before the eggs have set, add the lox and cook until just set. For a delicious variation, add 2 ounces of cream cheese to the eggs along with the lox and stir to evenly distribute it. Serve when the eggs are set and the cream cheese is melty. This version, from one of my favorite baking cookbook authors, Beth Hensperger (in the now out-of-print The Art of Quick Breads), is a bit of work, but it’s well worth it. You can use all apples (replacing the two pears), but the combination of the two fruits is terrific. The batter is similar to one used for crepes. Preheat oven to 425 degrees. Melt the butter in a skillet and sauté the apple and pear slices over medium-high heat just until tender, but still firm. Sprinkle with the brown sugar, cinnamon, and lemon juice. Stir to combine. Place an ovenproof 12-inch round or 9-by-13-inch rectangular glass baking dish in the oven to heat for 2 minutes. Remove the baking dish with oven mitts and scrape sautéed fruit into it and distribute evenly over the bottom. In a bowl, using a whisk, or in a blender or food processor, mix together the eggs, milk, flour, vanilla extract, and salt until well blended and smooth. Pour the batter over the hot fruit. Immediately place the pancake in the oven and bake for about 20 minutes, or until puffed and golden brown. Remove from oven and let stand about 5 minutes before cutting into wedges. Serve immediately, sprinkled with a bit of sugar and a squeeze of fresh lemon, if desired. Remember those little Drake’s coffee cakes from when you were a little kid? Here’s the grown-up version, adapted from Raymond Sokolov’s The Jewish American Kitchen. The recipes in this book are all exceptional, though the cookbook is worth buying just for award winning photographer Louis Wallach’s mouthwatering photographs. This coffee cake is lovely at breakfast or brunch, and even makes a light, elegant ending to a Shabbat meal. Preheat the oven to 350 degrees. Butter the bottom and sides of a 9- or 10-inch springform pan. Combine the brown sugar, cinnamon, and nuts in a small bowl and set aside. Sift together the flour, baking powder, baking soda, and a pinch of salt. Cream together the butter and sugar. Beat in the egg yolks and sour cream. Beat the egg whites until soft peaks form. Add the dry ingredients to the creamed mixture and mix well. Fold in the egg whites. Spread half the batter on the bottom of the prepared pan and sprinkle with half the brown sugar mixture. Cover with the remaining batter and top with the rest of the brown sugar mixture. Bake for about 45 minutes, until a tester inserted near the center comes out clean. Makes 6-8 servings. This fast, nutritious fruit milkshake combines fresh and frozen fruits and, if desired, a scoop of protein powder for an energy-boosting breakfast or snack. I love Trader Joe’s frozen fruit for smoothies—especially their sliced mango and peaches. Peeled cut-up bananas wrapped in wax paper and frozen add sweetness and richness. If you like a thinner smoothie, add a splash of orange or apple juice or milk; for a thicker one, increase the amount of frozen fruit. Add all ingredients to the blender and puree on high speed until thoroughly combined. You might need to stop the blender and push the fruit down (do not try to poke the fruit with a spoon while the blender is running. If too thick, add juice or milk. When you have a completely pureed mixture, pour into tall glasses and top with another dash of cinnamon, if desired.